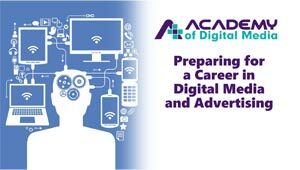 The ACADEMY of DIGITAL MEDIA has long been the source for accurate and up-to-date information and helpful tools for the rapidly and ever changing world of online advertising and marketing. Use our ROAS Calculator, Recommended Reading List, and Glossary to help boost your career. Read our FAQ to answer most often-asked questions. Download a course evaluation form to help us better train you and your peers in the future. 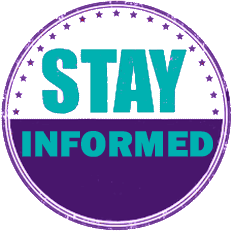 Also, if you need further information, join our mailing list to receive important course and industry news updates. With the constant evolution of the digital media ecosystem, new terms and acronyms quickly become part of the daily language of media and marketing professionals. The ACADEMY’s glossaries, with over a thousand terms, was developed to help you understand the vocabulary and jargon of digital media and digital marketing. The main glossary is inclusive of all the terminology and we created specialty glossaries for many of the important topics and categories such as programmatic, native advertising, research and measurement, targeting and campaign optimization. Please send us an email if you didn’t find a term or acronym and we’ll get back to you with the definition. Click on a Glossary title below to view and download the PDF. This is the most comprehensive glossary with all the most important and relevant terms used by digital media and marketing professionals. This exhaustive resource has over 1,000 terms and acronyms defined. Nearly 200 digital media industry acronyms defined including more commonly used acronyms such as CPM, CTR, DSP, KPI, RTB and OTT as well as less used but just as important to know acronyms including FBS, GDPR, IVT, NHT, LFV, MRAID, MSA and many more. Whether you buy, sell or manage digital advertising, the “behind the scenes” operations are critical to the execution, measurement and reporting of campaigns. This resource has over 180 terms related to ad and media operations. An important category of terminology to master for digital media and marketing professionals is ad programs, formats, placement and creative. This resource has defined 130 terms which you need to know in this category. There are over 125 terms in this resource that are specific to the work related to digital media buying and planning. If your work requires expertise related to developing campaign objectives and managing a digital campaign, this resource with approximately 200 terms will ensure you are familiar with the most important terms in digital media and marketing. As data is the fuel of digital advertising, media and marketing professionals need to understand the data lexicon and vocabulary of analytics. This resource has over 100 terms covering the basics of data and analytics. When one talks about the digital ecosystem, a conversation can include many topics from display, video, native to programmatic, social, search, ad networks and data platforms. This resource defines 140 terms related to the various components of the digital ecosystem. Email is a critical part of the marketing function, including many advertising opportunities. This resource has more than 30 essential email marketing terms. To prepare for the IAB’s Digital Media Sales Certification exam, there are over 150 important industry terms. This glossary includes the “need to know” terms for anyone who is preparing to take the IAB DMSC exam or Re-Certification exam. Understanding the mobile marketing and advertising ecosystem means understanding mobile media ad formats, targeting options, measurement, devices, usage, and technology. This resource includes over 70 terms relating to mobile advertising. As native and social advertising spend dominates the digital advertising industry, it is critical to know the terms that define these social platforms and native ad formats. This resource includes over 75 native and social media advertising terms. Programmatic media dominates the digital media ecosystem. Understanding and speaking confidently about digital advertising means mastering the programmatic vocabulary, essential for all media and marketing professionals. This resource includes over 125 terms defining the programmatic landscape. Media research, metrics and campaign measurement are part of every conversation about campaign effectiveness. This resource provides over 180 essential terms for defining campaign metrics as well as measurement concepts such as attribution, click fraud, data leakage, and many more. This resource includes nearly 100 of the most important terms that define how search engine marketing works and the components for launching SEM campaigns and key ingredients for search engine optimization. 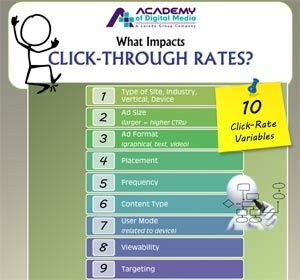 Every digital campaign is centered around different targeting options and performance metrics. This resource incudes approximately 170 terms that need to be recognized as part of any discussion about targeting or campaign performance. The two hottest areas of digital media ad formats are video and audio. 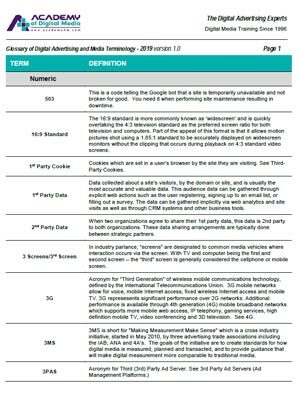 This resource details more than 100 terms related to digital video and audio ad types and formats, measurement, metrics and other related terminology. Understanding ad supported business and ecommerce means knowing the commonly used terms that define website analytics, content management, site and ad fraud and a host of other terms related to managing advertising and marketing for an Internet-based business. This resource includes 250 terms. Media and marketing professionals need to stay relevant and be able to discuss the latest news and develop or reference different perspectives on what’s trending and having an impact. This is a curated list of over 100 news sites, newsletters and blogs, including a description of each, sorted by category and with links embedded, that will help you keep informed and stay relevant. Please send us an email if you have a favorite resource, you’d like us to add to our list. Reading books has many benefits, beyond gaining new knowledge, like improving memory, imagination, and critical thinking. For media and marketing professionals, we want to share the books that have taught us new skills, changed our perspectives, and had an impact on our thinking and views on an array of topics. The ACADEMY’s Recommended Reading List includes over 125 books in various categories such as: General Advertising, Marketing Creative, Sales Skills, Sales Management, Presentation Skills, Story Telling, Innovation, Business Strategy, Data and Analytics, Social Media, Culture, Life Skills, Psychology, and Dealing with Change. Please send us an email if you have a favorite book, you’d suggest for us to read. Many plans, conversations and presentations use media calculations to establish expectations, illustrate opportunities and discuss results. The ACADEMY’s media calculator is a great tool that will help you with calculating media spend requirements, impression levels, CTR performance and costs (CPM and eCPM). 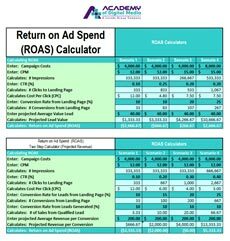 In addition, the Return on Ad Spend (ROAS) Calculator™ will allow you to calculate return on media investments and adjust the values to compare different scenarios and outcomes. The Reverse ROAS is a great tool that will allow you to determine the number of and costs for conversions or leads generated, based on impressions, CPM, and costs. More infographics are available here. These free resources and tools will help you build on your knowledge and skills in digital media and marketing. Please enter your first name and email and you are one click away from receiving them. Add your name to our mailing list and you’ll hear from us when these are updated and new resources and tools are available. Click here to be added to our mailing list so we can keep you informed of new resources, training programs and other news from the Academy of Digital Media. You can opt-out at any time using the unsubscribe link in our emails. We won’t sell or share your contact information.